The Royal Scottish Country Dance Society was formed over 90 years ago to preserve and further the tradition of Scottish country dancing. Today there are branches and classes worldwide and a wealth of published dance instructions and music. 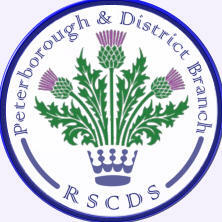 The Peterborough & District RSCDS Branch was established in 1981 from a group which had been dancing since the 1960s near St. Andrew’s Church of Scotland (Netherton) and the Branch now meets every Tuesday (September to May) in St. Mark’s Church Hall, Lincoln Road, Peterborough PE1 2SN, from 7.30pm to 9.30pm. At the Tuesday class, experienced dancers and beginners dance together and are guided through steps, figures and dances by a teacher. There is a monthly advanced class for experienced dancers. The Branch also holds several social functions during the year, including two Dances with live music, six afternoon Tea Dances, and a Burns Supper Dance. In June 2015, the Branch held its first Dance Weekend, with two evening social Dances, classes with two experienced RSCDS teachers, a buffet tea and live music throughout. This event was supported by a grant from the Jean Milligan Memorial Fund. In June 2016 & 2017 we were delighted to demonstrate Scottish Country Dancing in Cathedral Square as part of Armed Forces Day.